A good Adrenal Fatigue diet includes easy-to-digest food and recipes. That means soup is a great recipe to make. This recipe is full of spices and herbs that not only offer health benefits, they are a low calorie way to add zest to your meals, or in this case, your soup. When the food is tastier, it is more satisfying, which is very important for those with advanced adrenal exhaustion who have no appetites or have the need to eat frequently. Make sure you get the freshest herbs and spices whether they are fresh or dried. Their active compounds degrade with time. Polyphenols are the plant compounds that provide the main health benefits. Some herbs and spices have antibacterial and antiviral properties that curb inflammation very pronounced in the adrenal fatigue sufferers. If you prefer the soup to be spicier, you can add more chili. The hotter the pepper, the higher the concentration of the substance called capsaicin, which has been shown to relieve pain and fight inflammation. Dill may help to neutralize some carcinogens, and it is high in iron and calcium. Raw parsley and coriander is loaded with vitamin C. Coriander happens to be high in iron also and contain so many phytonutrients to help fight disease. Garlic has anti-cancer, cold prevention and heart health benefits. Make sure you let the chopped garlic sit for 10-15 minutes to release the protective phytochemicals. The capsaicin of paprika has anti-inflammatory and antioxidant effects. Vitamin C in the body can be boosted by the phytochemicals in onions, thereby improved immunity. Folate found in onions may help improve sleep and mood, which is quite needed by many who suffer from adrenal fatigue. Using a large stockpot, add Ingredients A. Put everything from step 1 and step 3 into a blender or Vitamix and puree. Pour back into the stockpot and simmer. In a separate frying pan, add Ingredients C and stir-fry until onion becomes opaque. Pour into the stockpot, bring to boil, simmer for 15 minutes. Stir in Ingredients D and simmer for 10 minutes. 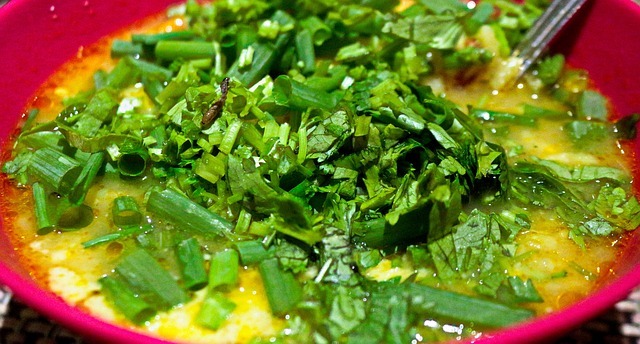 Spoon the soup into soup bowl, garnish with coriander sprigs.